Vermont beekeepers face mite infestations, extreme temperature swings and the possibility of colony collapse. Last fall, a new threat emerged: zombie bees. Beekeeper Anthony Cantrell of Burlington discovered zombie bees in his hive in October, the first time they'd been found in the eastern United States. John Hafernik, a professor from San Francisco State University, discovered the first zombie bees in 2008. A fly called Apocephalus borealis attaches itself to the bee and injects its eggs, which grow inside the bee, Hafernik said. Scientists believe it causes neurological damage resulting in erratic, jerky movement and night activity, "like a zombie," Hafernik said by phone Tuesday. These aren't undead bees doomed to roam for eternity. They often die only a few hours after showing symptoms, Hafernik said. Hafernik and his team of colleagues and students have been tracking the zombie bee spread across the United States. California, Washington, Oregon and South Dakota all have confirmed zombie bees while this is the first time the bee has been found this far east, said Hafernik. The fly previously attached to bumblebees as hosts, not honeybees, according to Hafernik. "Right now, we don't know if it's an isolated thing," Stephen Parise, Vermont agricultural production specialist, said Tuesday at the state's annual farm show. The Vermont Agency of Agriculture hopes to use trapping to investigate the threat. Parise also told the Vermont Beekeeper Association that he expected more bee deaths this year due to wild temperature swings. Chas Mraz, of Champlain Valley Apiaries, said mites, viruses and pesticides are bigger health issues for honeybees. A lack of nectar and pollen in a changing agricultural ecosystem focused more on corn and soybeans could affect bee immune systems, he said. "There's tremendous pressure on bees," Mraz said. The apiary has been operating since 1931 and houses about 1,200 bee colonies. At peak population in good weather, that means over 60 million bees. University of Illinois entomologist May Berenbaum, a top bee expert, agreed. "It is seemingly kind of Biblical here," she said. "We're getting every conceivable kind of plague." Given the way bee populations have become so homogenized and how they are shipped cross country to aid in pollenating, the first Eastern infection of the zombie fly makes sense, Berenbaum said. "It's not surprising; it's certainly not good news," Berenbaum said. "There are so many pathogens and parasites that we're aware of that are afflicting bees." New research by the U.S. Department of Agriculture released this month showed that a plant virus - tobacco ringspot virus - is now infecting commercial honeybees, Berenbaum said. Leif Richardson, a doctoral student at Dartmouth College studies the interactions between plants, pollinators and parasites. Richardson said the fly involved in zombie bees could, besides using honeybees as hosts, potentially transmit viruses and pathogens. 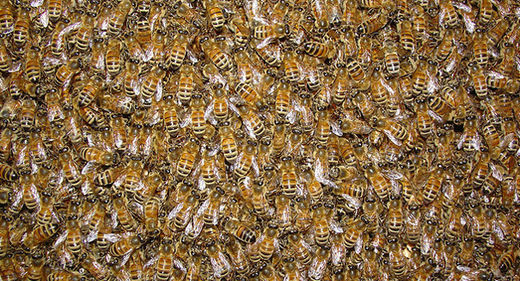 Beekeepers "should definitely be concerned about it," Richardson said. Hafernik said it would be a "game changer" if these flies could hatch from dead bees and complete their life cycle inside the hive, something that most worries Cantrell. "I think it would be another nail in the coffin for honeybees in the northern hemisphere," Cantrell said.